§ Mr. David Alton (Liverpool, Mossley Hill)During the course of this debate it seems that we have been tilting at a number of imaginary windmills. Some speakers have referred to the breaking of the Union while others have talked about the creation of a united Ireland. It is quite clear to anyone who has taken the trouble to read the proposals that neither of these issues is contained within the agreement. Repeatedly arguments have ben put up to defeat issues that are not within the agreement. The right hon. Member for Lagan Valley (Mr. Molyneaux), the leader of the Ulster Unionist part, talked about the possibility of a high-powered initiative for federation which he said was in the 1979 briefing notes sent out by Conservative central office. I personally believe in confederation as an approach. Confederation would enable the Irish of the north who are Catholics to look towards Dublin, whilst the Irish of the north who are Protestants or unionists would look towards London. However, this agreement is no more about confederation than it is about breaking the Union or the creation of a united Ireland. The agreement is a genuine attempt by the Prime Minister and the Taoiseach to break the straitjacket that has become Northern Ireland. The Hillsborough agreement represents the outcome of months of effort by politicians and civil servants who have made a genuine effort to reconcile the two traditions in Ireland. Like the hon. Member for Eastbourne (Mr. Gow), I have had the privilege of spending time in Northern Ireland and the Republic, most recently as part of a Liberal-SDP commission under Lord Donaldson. 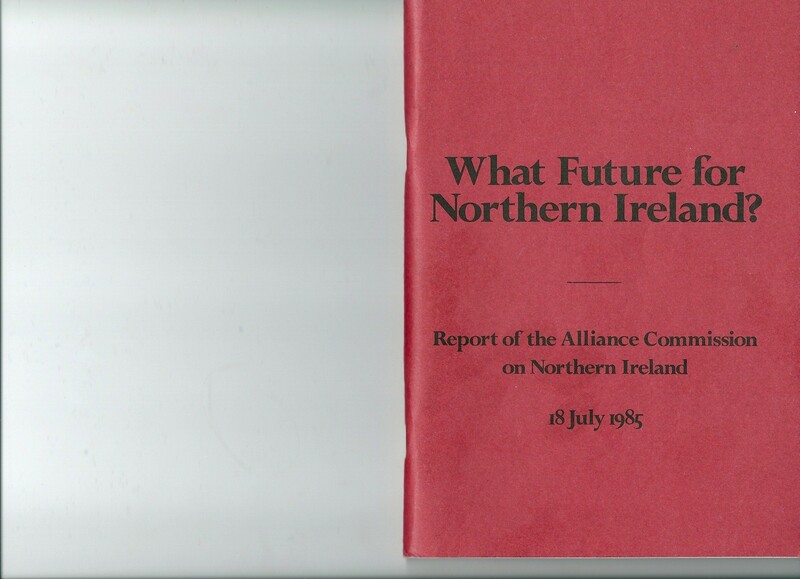 In July, we published our report entitled “What future for Northern Ireland?” Many of the ideas promoted in that report are contained in the agreement. However, we would have gone further on issues such as the Anglo-Irish parliamentary tier. I was pleased when the Prime Minister said earlier that it is something that the House and the Dail could consider further. A parliamentary tier would help to compliment those initiatives which have been taken in this agreement. We recognise the Hillsborough agreement as an honest and brave attempt to wrench the initiative from the men of violence and to take a few, albeit faltering, steps away from the bigotry and hatred which have led to 2,500 deaths during the past 16 years, 24,000 injuries, and some £11 million-worth of damage in Ulster caused through acts of political violence. We welcome the initiative because it marks an important change in the attitude of the two Governments towards one another. Some years ago the brave non-sectarian Alliance party in Northern Ireland said: positive development of Anglo-Irish relations could lead to the growth of mutual trust and respect in place of bitterness and recrimination which has bedevilled Anglo-Irish relations for too long. Hillsborough is a step along that road. This agreement is the bulwark against Sinn Fein. If it fails, it will give credence to the lie that violence alone can bring progress. It will lead to the enticement of more young men and women into violent organisation and violent actions. This agreement is a courageous step by the Prime Minister and the Taoiseach to challenge and defeat that lie. Those who choose to distort and lie about the content of this agreement will be taking the side of violence to sustain their tribalistic and sectarian positions, deliberately 771 keeping alive divisions for their own selfish political ends. The Nobel peace prize winner, Solzhenitsyn, understood the nature of violence. He said: Violence can only be concealed by the lie. Anyone who has once proclaimed that violence is his method is inevitably forced to choose the lie as his guiding principle. The way forward in Northern Ireland is through mutual respect, mutual forgiveness for past injuries and wounds and building up the common ground. During the Donaldson commission inquiry, I visited the Maze prison where I met a young man, Liam McAnoy. That young man, brought up on the Falls Road, at the age of 18 joined the official IRA, and he committed a murder. He has since renounced violence and 12 years later I had the privilege to meet him. Since then we have corresponded. Justice requires, just as peace demands, the pacific coexistence of both communities in mutual acceptance and respect and in equality of rights. Violence and talk of civil war makes the attainment of co-existence more difficult. The creation of that justice requires the establishment of bodies such as the Intergovernmental Conference which must win the respect of the Protestant and Catholic communities alike. The founder of the Corrymeela Community, the right Reverend Dr. Ray Davey, in a sermon at Westminster abbey in March 1980, signalled the other prerequisites for peace in Northern Ireland. He said: Truth demands that we be willing to look at another’s point of view when it is opposed to ours and to try to understand it. Liberals believe that this requires a moderation which is the only hope of reconciliation. In the spirit of trying to understand another point of view it is incumbent on all the people of Great Britain, especially the English people, to try to understand the fears and anxieties of the unionists. This agreement was made in secrecy, largely without consultation, without information and without consent. While Dublin—I make no complaint about this—kept the SDLP in the picture, the British Government chose not to involve the Northern Ireland parties in the Hillsborough process. Assemblyman John Cushnahan, the Alliance leader, whom I met here last Friday, told me that many people in Northern Ireland are gravely dissatisfied with the way the agreement was made. We agree with him. Their condition, which is a fair one, is that the secrecy must now end. At the minimum, agendas and conclusions reached by the Intergovernmental Conference must be published. If that does not happen, every matter pursued by the Secretary of State will be represented by some unionists as deriving from the Republic through the deliberations of the Intergovernmental Conference. Unionists may be tempted to shout treachery and no surrender and to retreat behind historical images of the siege of Londonderry. The unionists claim to be law-abiding members of the Union. How will that square with the erection of shutters and barricades and the repudiation of an agreement endorsed by two democratically elected Parliaments? The remarks by the hon. Member for Upper 772 Bann (Mr. McCusker) were out of accord with the unionist tradition which has always pledged itself to constitutionality. This morning, my right hon. Friend the Member for Tweeddale, Ettrick and Lauderdale (Mr. Steel) said: The so-called loyalists in Northern Ireland must look again at their definition of loyalty, which means nothing if it does not include support for the authority of the Westminster Parliament. To threaten unconstitutional action even before Parliament has had a chance to debate the proposals will be the action of disloyalists and would only harden the belief of the British people that the unionists are quite incorrigible. § Mr. Molyneaux Would the hon. Gentleman accept that at the rally on Saturday in Belfast, when passions were running somewhat high, the main cheer came for the portion of my speech when I said: Violence is no part of our campaign”? I was speaking on behalf of my colleagues on this Bench and of my colleagues who represent the Democratic Unionist party. § Mr. Alton I am glad to hear the right hon. Member for Lagan Valley say that. It is in complete sympathy with everything that I have heard him say in my six years here. I was distressed to hear the comments of one of his colleagues. I hope that we shall talk, as we have during this debate, about how Parliaments and elected Members can reconcile the two traditions. That is the only way to defeat the people who murder and maim to achieve their political objectives. We appreciate the suffering of unionists, especially during the past 16 years. As many right hon. and hon. Members have said, they are a keen and proud people, but they should remember that we on this side of the water have also suffered. Many of our constituents who were members of Her Majesty’s forces have been murdered in the Province. The financial burden has been heavy, and there has been a not inconsiderable loss of civil liberties in Britain because of the tragedy of Northern Ireland. We in the United Kingdom do not regard the Republic as our enemy. There is a special relationship between us. Many millions of Irish people live and work in Britain and many thousands of British people live and work in Ireland. We are closely integrated. The unionists have a right to be upset by the triumphalism and the talk of victors and vanquished, of which some Catholic clergymen, alas, and politicians have been guilty. As an English Catholic, I regret the continued intransigence of the Catholic Church on issues such as mixed and inter-Church marriages and integrated Christian education. Like the right hon. Member for Waveney (Mr. Prior), I regret that the SDLP has so far made no gesture to the unionist community about whether it will participate in the Assembly. I hope that the leader of the SDLP will be able to say something about that later. § Mr. John Hume (Foyle)The hon. Gentleman should listen to me more often. § Mr. Alton I listen regularly to the hon. Gentleman and admire much of what he stands for. The SDLP should now drop its veto on the Northern Ireland Assembly and commit itself to partnership in government in the North. It should also encourage more Catholics to join the Royal Ulster Constabulary. When I was in Northern Ireland earlier this year and met Sir John Hermon, I was intensely worried by the RUC’s difficulty in encouraging more Roman Catholics to join, although there has been some improvement this year. What is needed is a partnership at the level of a devolved government”. If the Government use the Northern Ireland (Constitution) Act 1973 as a framework for devolving power, the guarantees that the Catholic community in the North should be able to expect would be missing. I hope that the Secretary of State will be clearer about the power-sharing proposals and that the SDLP’s lingering doubts will be removed. Partnership in government is the best way to remove the alienation of the north’s Catholics—of finally extinguishing the Bunsen burner that has kept the cauldron smouldering. Those of us who heard Noel Dorr, the Irish ambassador in London, speak here last night will have noted that he stressed the alienation of the Roman Catholic community in Northern Ireland. The agreement is about removing that alienation. That is why it is worthy of support. For unionists, the incentive for being involved in such a partnership is that it will reduce the influence held by Dublin. If political leaders refuse to provide their people with the leadership that they are entitled to expect, the people must be prepared to change those leaders, whether they be unionist or nationalist. The Government should ensure that a copy of the agreement is sent to every household in Northern Ireland. It is not good enough to be told that it has appeared in some Belfast newspapers. If unionist politicians now try to wreck the agreement by forcing by-elections—and I desperately hope that they will reconsider such action—the Government should be prepared to consider holding those elections under a system of proportional representation, as currently applies to local government, Assembly and European Parliament elections. That would turn the elections into a far more convincing test of public opinion and enable the Government to reach over the heads of sectarian leaders. There is something in the agreement for everyone. For unionists, there is a double guarantee of their right to self-determination within the Six Counties. There is an acceptance of their identity by Dublin and an acceptance that it will be registered publicly at the United Nations. There is to be no Executive rule and no joint authority, both of which are anathema to unionists. There is also the Republic’s commitment to ratify the European convention on the suppression of terrorism. There is the promise of better cross-border co-operation and improved security—progress on extradition and trials in another jurisdiction. For nationalists, there is a recognition of their identity, respect for their democratic aspirations and for their symbols, culture, sports and repeal of offensive legislation such as the Flags and Emblems (Display) Act 1954. There is a chance to be partners in government and of parity of esteem and equality of opportunity. For all, there is an opportunity of better human rights for individuals and groups and a framework for greater cooperation between our two countries. There is the opportunity for more common services to be developed and the chance in the longer term of parliamentary cooperation and a permanent body to oversee the 774 Intergovernmental Conference. There really is something in this agreement for everyone, and I hope that moderate Unionist politicians will re-examine it in that light. The alliance report, which we published in July, said: the status quo in Northern Ireland is not an option. That view has been echoed time and again today. The Irish and British Governments have acted boldly in an attempt to shift the status quo. They deserve broad support. Perhaps a small window has opened in Northern Ireland. If men and women of ill will now slam it shut, the violence and despair that will inevitably follow will be upon their heads. The debate had been introduced by the Prime Minister, Margaret Thatcher MP. § Mr. Speaker We now come to the important debate on the Anglo-Irish agreement. I have not selected either of the amendments on the Order Paper. That this House approves the Anglo-Irish Agreement (Cmnd. 9657) signed on 15th November by the Prime Minister and the Taoiseach, Dr. Garret FitzGerald. Since 1969, nearly 2,500 people have lost their lives in Northern Ireland as a result of terrorism, more than 750 of them members of the security forces. As the House is only too well aware, there has also been further loss of life among the armed forces, police and civilians in the remainder of the United Kingdom, including three of our colleagues in this House. That is the stark background to today’s debate and it takes us immediately to the historic divisions between the two communities in Northern Ireland, which we cannot ignore. Whatever the differences that may emerge in our debate, I believe that we shall all be united in our determination to end the violence and to bring to justice those who are guilty. We shall all be united in our deep sympathy for the thousands of families whose lives have been darkened by the shadow of the gunman and the bomber; and we shall all be united in our admiration and gratitude for the men and women of the security forces in Northern Ireland and, indeed, from all parts of Great Britain, so many of whom have paid the price of protecting us with their own lives. But it is apparent that any initiative, however modest, to bring the people of Northern Ireland closer together to beat the terrorists raises emotions and fears rooted deep in the past. I understand those fears, although I do not believe them to be justified. Faced with all that we have seen in the past 16 years, it was not enough for the Government to rely solely upon the security forces, valiant though they are, to contain and resist the tide of violence. Let me make it clear that there can be no such thing as an acceptable level of violence, whether in Northern Ireland or elsewhere in the United Kingdom. The Government owe a duty to the security forces and to all the law-abiding people of Northern Ireland, Protestant and Catholic alike, to do everything within their power to stamp out terrorism—not by giving in to the terrorist, not by giving him a single inch. Indeed, the fact that the terrorists have condemned the agreement is a demonstration that we have done no such thing. The fight against terrorism is greatly weakened if the community is divided against itself, and it is greatly strengthened if all people committed to democracy and the rule of law can join together against the men of violence. That, the Government felt, required a further attempt to reconcile the two communities in Northern Ireland. The Unionist community, firmly loyal to the Crown and to the United Kingdom, represent a proud tradition of devotion to the Union which everyone in these islands should respect, and which this agreement does respect. They have a right to feel secure about Northern Ireland’s position as part of the United Kingdom. This agreement, by reinforcing the principle of consent, should make them 748 feel more secure, not only today but in the future. Unionists have the assurance that neither an Irish Government, nor of course a British Government, will try to impose new constitutional arrangements upon them against their will. The nationalist community think of themselves as Irish in terms of their identity, their social and cultural traditions and their political aspirations. The House can respect their identity too and acknowledge their aspirations, even though we may not see the prospect of their fulfilment. The only lasting way to put an end to the violence and achieve the peace and stability in Northern Ireland is reconciliations between these two communities. That is the goal of this agreement. I now draw the attention of the House to what I consider to be the most significant points of the agreement. The preamble sets out the commitment of the United Kingdom and the Irish Republic to work for reconciliation; our utter and total rejection of violence; our recognition and respect for the separate identities in Northern Ireland; and our acceptance of the right of each to pursue its aspirations by peaceful means. These principles reflect the hopes of both communities. Article 1 of the agreement makes it abundantly clear that there is no threat whatsoever to Unionists’ heartfelt desire to remain part of the United Kingdom. It provides, in a formally binding international accord, a recognition by the Irish Government that the status of Northern Ireland will remain unchanged as long as that is the wish of a majority of the people of Northern Ireland. It recognises also that the present wish of a majority is for no change in that status. There can be no better reply to the fears that have been expressed in the House than this explicit recognition of the legitimacy of the Unionist position. Article 2 of the agreement acknowledges in a practical and strictly defined way the concern that the Irish Republic has with matters relating to Northern Ireland. In the past, that concern has sometimes been expressed in critical or negative terms which did not help the cause of harmony between the communities in Northern Ireland. Article 2, therefore, establishes an Intergovernmental Conference. This will have no executive authority either now or in the future. It will consider on a regular basis political, security and legal matters, including the administration of justice, as well as cross-border co-operation on security, economic and cultural matters. This co-operation will not be a one-way street. The Irish Government will be able to put forward views and proposals on certain matters affecting Northern Ireland. We for our part shall be able to pursue issues of concern to all peace-loving people in Northern Ireland. Notably cooperation in the fight against terrorism—co-operation which goes beyond the borders of Northern Ireland. The matters within the scope of the conference are spelled out in greater detail in articles 4 to 9 of the agreement. I should like to draw the House’s attention to three particular points about these articles. First, if devolution is restored, those matters that become the responsibility of the devolved Government will no longer be within the purview of the intergovernmental conference. We hope that the agreement will encourage the constitutional representatives of both communities to come together to form a local administration acceptable to both. This hope has been specifically endorsed by the Irish Government. My right hon. Friend the Secretary of State for Northern 749 Ireland will be exploring with the constitutional parties how best to make progress. Meantime, the Assembly continues in being, with all its statutory responsibilities. Secondly, article 8, which deals with legal matters, says that consideration will be given to the possibility of establishing mixed courts. Let me say straightaway that we have absolute confidence in the judiciary in Northern Ireland. Indeed, the integrity and courage which they have shown in recent years in maintaining high standards of judicial impartiality have been outstanding. We know the difficulties which would be involved in mixed courts both in Northern Ireland and in the republic. We recognise the reservations which are held by the legal profession. We see no easy or early way through these difficulties. That is why, although we are prepared to consider in good faith the possibility of them at some future time, we have made it clear that we are under no commitment to introduce them. Thirdly, I draw the House’s attention to the proposals for improved security co-operation in article 9. This provides for a programme of work to be undertaken by the Chief Constable of the Royal Ulster Constabulary and the Commissioner of the Garda to improve co-operation in such matters as threat assessment, exchange of information, technical co-operation, training of personnel and operational resources. The really vital element in this programme is fuller and faster exchange of information, especially pre-emptive intelligence which helps to prevent acts of terrorism. These are specific measures which I believe will lead to real improvements in security—improvements which will be welcome above all to those men and women who live in the border areas and who have been subjected to so many merciless attacks designed to drive them from their homes and farms. That improvement should be further reinforced by the Irish Government’s intention to accede to the European convention on the suppression of terrorism. The convention’s purpose is to ensure that those who commit terrorist offences should be brought to justice and that any offences involving the use of explosives or firearms should not be regarded as political. Irish accession should greatly increase our prospects of securing extradition from the republic of persons accused or convicted or terrorist crimes. This will be a major and a welcome step forward in the war against terrorism. I draw the House’s attention to the reference in article 12 to the possible establishment of an Anglo-Irish interparliamentary body. Both we and the Irish Government felt that this was a matter for our Parliaments themselves rather than for Governments to pursue. I hope that contacts will be established through the usual channels to consider how discussions on an interparliamentary body can most effectively be taken forward. I have tried to explain to the House the most significant points of the agreement. In view of some of the mistaken claims about it, I want also to say something about what is not in the agreement. The agreement does not affect the status of Northern Ireland within the United Kingdom. It does not set us on some imagined slippery slope to Irish unity, and it is nonsense to claim that it might. The effect of article 1 is to confirm the provision in section 1 of the Northern Ireland Constitution Act 1973 that Northern Ireland remains part of the United Kingdom as long as a majority there so wish. That again is a 750 recognition of reality. The guarantee for the majority lies in the fact that it is a majority. That fundamental point is reinforced by this agreement. § Mr. Eric S. Heffer (Liverpool, Walton)I have listened carefully to the right hon. Lady. Can she explain why the Irish Government signed the agreement? § The Prime Minister I believe that the Irish Government signed the agreement because they share with us its objectives: to try to defeat the men of violence and to try to achieve peace and stability for all the people who live, and who will continue to live, in Northern Ireland. If the hon. Gentleman wishes to read it, all of this is set out fully in the preamble to the agreement. Second, I want to make it clear that the agreement does not detract from British sovereignty in Northern Ireland—or, for that matter, from Irish sovereignty in the republic. We, the United Kingdom Government, accountable to Parliament, remain responsible for the government of Northern Ireland. Yes, we will listen to the views of the Irish Government. Yes, we will make determined efforts to resolve differences. But at the end of the day decisions north of the border will continue to be made by the United Kingdom Government anc south of the border by the Irish Government. This is a fundamental point. There can be no misunderstanding. Third, I want to dispel the absurd notion that the Government will listen to the views of the republic on Northern Ireland matters, but not to the views of our own unionist community. There are already many ways in which the majority community in Northern Ireland can and do put their views to the Government. The right hon. and hon. Members of this House who represent the unionist parties are themselves an important channel. Another is the Northern Ireland Assembly, an important and experienced body which could be used to improve the arrangements for consultation. Yet another is the many representations that unionists make to Ministers. The unionist voice is clearly heard and will continue to be heard. If the Anglo-Irish agreement is to bring about a real improvement in the daily lives of the two communities in Northern Ireland, it must be matched by a detennined effort on the part of all law-abiding citizens to defeat the men of violence. And that effort must rest on clear and consistent principles of justice, equity and fairness. For if democracy is the rule of the majority, the other side of the coin is fairness and respect for the minority, for all are citizens of the United Kingdom. On the economic front, we will continue to pay special attention to Northern Ireland’s needs. During direct rule, spending on economic and social programmes has risen since 1972–73 by 50 per cent. in real terms to £3,600 million last year. That amounts to nearly £2,500 a head, far more than in any other part of the United Kingdom. Spending on that scale shows the high priority given by successive Governments to the needs of Northern Ireland and its people. Our concern will continue. On security, our efforts will also continue. Thanks to the magnificent work of our policemen and soldiers, we have already made some progress, but we still have much to do. I believe that our security forces can take new heart from the promise of greater security co-operation that will flow from the agreement. In commending this agreement to the House, I should like first to pay tribute to Dr. Fitzgerald, who has worked 751 honestly and sincerely for an agreement to bring reassurance to both communities and a real prospect of peace and stability. Second, I say to the members of both communities in Northern Ireland that, if Parliament approves the agreement, the Government will steadfastly implement it. This House represents all the people of the United Kingdom and its decisions are binding on all of them. We shall not give way to threats or to violence from any quarter. We shall look to the co-operation of all men and women of good will who want a better future for Northern Ireland and for their families. § Mr. Michael McNair-Wilson (Newbury)Before my right hon. Friend leaves the point about the accountability of Parliament, will she say whether there will be any opportunity for Parliament to know about the deliberations of the Anglo-Irish conference? Will its deliberations be made public anywhere, or debated? § The Prime Minister It is not expected that everything that is said in the intergovernmental conference will be made public. I am giving consideration to how we can report to the House, for obvious reasons. We attend many intergovernmental conferences in Europe and elsewhere and usually report to the House about those that we attend. I am giving urgent consideration to this matter because I realise that there is concern about it. Finally, I address myself once more to those among the unionist community who have openly expressed their fears and worries about this agreement. Far from representing any threat to the union of Northern Ireland within the United Kingdom, the agreement reinforces the union, and that should bring reassurance and confidence to the unionist majority. It clearly recognises—as it should—the validity of their great tradition, and it holds out the prospect of greater success in the struggle against terrorism from which the majority have suffered so much. As one who believes in the union. I urge the unionists to take advantage of the chance offered by the agreement. We embarked on this agreement because we were not prepared to see the two communities for ever locked into the tragedies and antagonisms of the past. The younger generation, above all, has a right to expect more than that. The price of new hope is persistent endeavour. That is what we ask, and ask equally of all.